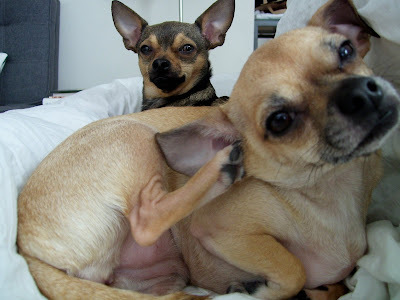 In my personal profile, I made reference to my two perfect chihuahuas. It is my pleasure to introduce you to Joy (foreground) and April. My partner and I adopted them in September 2007 from a breeder in Bristol, Virgina, which is about a 5-hour drive south of where we live. Joy is approximately 2 years, 2 months old, and April is approximately 1 year,11 months old. They each weigh about 8 lbs. Joy is soft and mushy. She loves to be held and gently caressed. She'll lie right next to me in bed, with her head sharing my pillow and the rest of her body beneath the comforter. She has a big appetite and will stand on her hind legs and hit me as I'm pouring food into her bowl. And she loves to play fetch with her many plush toys. April is a little rebel. If I tell her not to do something, she'll still see if she can get away with doing it. If she doesn't get her way, she becomes loud and mouthy. She is energetic and can run around the park non-stop for hours. She's always smiling - her grin reminds me of the Joker! And she loves to be vigorously caressed, especially on the top of her head.